Updated following some great comments so make sure to read them. Look forward to more feedback and thanks for taking the time to post! The Wild Herrings were formed in Ballyshannon, Co. Donegal in 1985 and remained active until 1987. 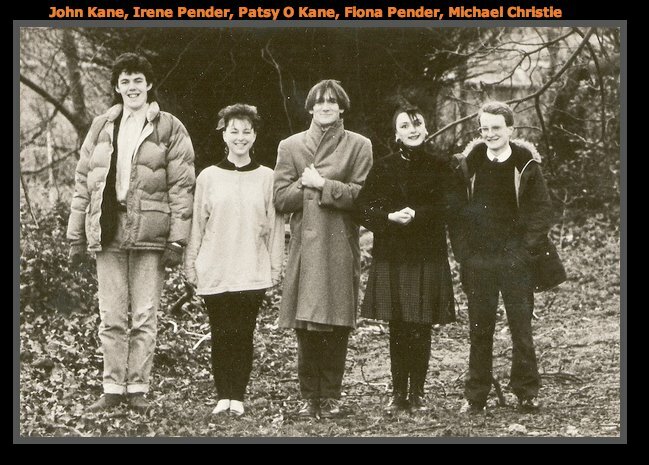 The band consisted of John Kane (guitar), Fiona Pender (vocals and sax), Irene Pender (vocals), Patsy O Kane (bass) and Michael Christie (drums). Four of the Wild Herrings went on to form punk-pop group The Malfunctions who reached 27 in the single charts. The Malfunctions (minus singer Fiona) became Georgia who knocked Bryan Adams off number 1 with their single “Sends Me High” on Danceline Records only to be disqualified because too many of the sales were in the north-west of Ireland! Micheal Christie is currently active with The Boxtie Band. I never managed to see them live, maybe they didn’t make it as far south as Limerick but have read of a Bundoran gig. I was lucky enough to catch their Fanning Session though and thankfully record it. The quality isn’t great but hopefully that won’t detract too much from what I think are some standout tunes. Without further ado..
Update: Fiona and Irene are back gigging again as The Pender Sisters and have played a couple of shows in Derry at Sandinos and Cafe Del Mondo. They are playing a post Christmas show in Dicey Reilly’s bar in Ballyshannon on December 27th from 10.30 to 12.30 if you’d like to catch them. This entry was posted on May 14, 2009 at 8:30 am and is filed under Music, session with tags #iwd, donegal, Fanning, indie, irish, session, wild herrings. You can follow any responses to this entry through the RSS 2.0 feed. You can leave a response, or trackback from your own site. They were actually from Ballyshannon in Co Donegal – my brother played trumpet with them when he was about 13! Thanks Jasper have corrected that, not sure where I got Killybegs but I was sure that’s where they were from. So did your brother do any gigs or was it all studio work? I’m pretty sure it was just studio work. Four of the Wild Herrings (including my brother) formed a similar punk-pop group called The Malfunctions who had one single reach no 27 (i think). The Malfunctions (minus the singer Fiona) became Georgia who actually knocked Bryan Adam’s “(Everything I Do) I Do It For You” off no1 with a tune called “Sends Me High” but they got disqualifed from the charts cause too many of their records sales were in the north-west of Ireland! I think that made it made the front page of The Irish Press!!! hi im michael christie the herrings drummer. glad you liked the fanning session- have never met anyone who even remembers that band. patsy o kane -bass and myself. i currently play with johnny gallagher and the boxtie band which is a different beast entirely- check it out on youtube. finally i also did a fanning session in 1989 with the malfunctions which also had fiona pender as lead singer. Hello Micheal, great to hear from you. I am a big fan of The Wild Herrings as you can probably tell from the recordings – the tape is almost worn out! Can you tell me some more about the recordings you made, how many songs did you record for Dave Fanning, did I get them all or are there more? Do you have any photos or posters, I would love to add an image or two for posterity’s sake..
Hello Irene, thanks for stopping by! Great to hear you are gigging, hopefully I’ll be able to catch you in the flesh this time round 😉 Any chance of a MySpace page for The Pender Sisters so you can keep us posted of gigs? I can help out if you like..
Go for it!!! I’m technically illiterate and Fiona’s allergic. We’re playing in Dicey Reilly’s bar in Ballyshannon on December 27th from 10.30 to 12.30 if you’re really keen. Not too sure about how much flesh you’ll see – it’s a bit chilly for that! great to hear those tracks again. fantastic.mates mentioned youse yrs ago.have had the bald aggresssion tape from the 80s,they were a great letterkenny band.last 2 of yr trax were great pity not on vinyl.one of lads who dis neu carnage fanzine in late 70s early 80s paul mc carroll from donegal used to go to yr gigs.any chance of posting any pix,theres a huge interest in retro irish punk.also i have yr malfunctions 7”. ‘Hennigans’ of Sligo (of the 50s/60s/70s), before the actual Hennigans sold it, was the bee’s knees. Proper artisans meeting point. It went south quickly during the following ownership. ‘Georgia’, how they are missed. Legendary Donegal band. the HERRINGS<OUTCASTS<AND BOYS.that would be worth seeing.saw john plain of the boys playing arthurs thomas st last night.great gig.how bout getting THE BOYS and OUTCASTS and HERRINGS together in letterkenny??? Found an old tape with a Fanning session……tracks included: Up Donegal, Buy Me A Drink, Materialistic, and Crash & Burn! Think I have ye on video somewhere, from your appearance(s) on RTÉ’s ‘Screen Test’!